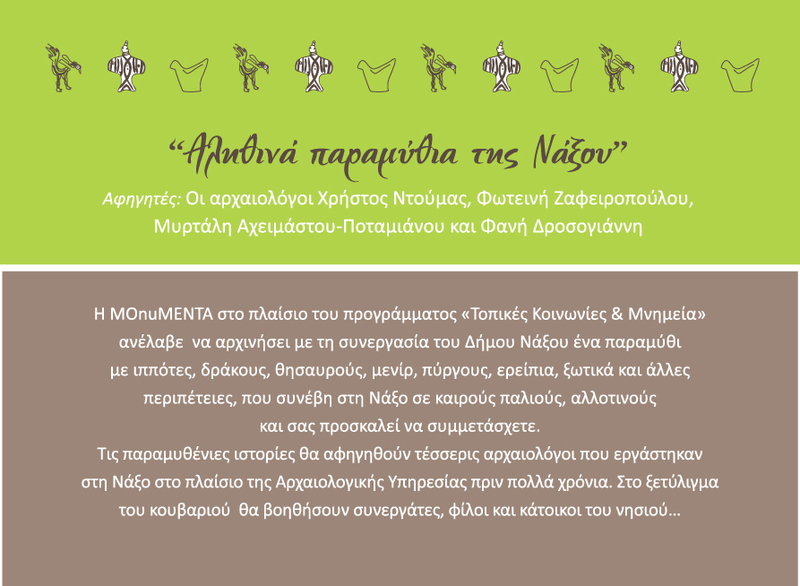 MOnuMENTA through the programme "Local Communities & Monuments" is composing, with the help of the Municipality of Naxos and Small Cyclades, a fairytale including knights, dragons, treasures, menhirs, towers, ruins, elves that actually happened in Naxos in earlier, distant times. These fairytales will be narrated by four archaeologists that worked in the Archaeological Service in the period 1960-1995, leaving their mark to the research, protection and enhancement of the archaeological wealth of the island. Their comrades along with friends and the people of the island will help to the unfolding of the fairytales. These will take place in Naxos island, in the ex-College of Ursulines (Castle of Chora, Naxos) on Sunday 3rd July 2011, 7 p.m. The fairytales will end with a small feast. Through this, we attempt to examine an alternative perspective, unexplored in terms of interpretation, considering the social past and present of the monuments, commencing at the same time our research on intangible heritage about understandings, uses and management of monuments, products of which will be published in due course on our new website. The "True fairytales of Naxos" are kindly supported by VALLINDRAS distillery and AKTAION pastry shop.